The world of Grateful Dead art is incredibly rich and fascinating. When I say art I mean specifically visual art. Of course music is their primary art form but that's the focus of the rest of this site. In this section I'm going to explore the graphic arts which have come to be synonymous with the band and their music. 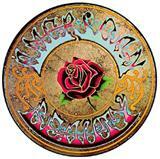 I think it's safe to say that mind altering drugs had a huge influence on the music of the Dead. I'm sure the chemicals also had a major influence on the artists that illustrated their trip. Many of the surreal images found in Grateful Dead art can be seen as graphic representations of the visions produced by the potent combination of drugs and music. 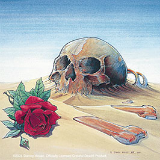 The band's name also played a big part in their artwork as evidenced by the skulls and skeletons that appear everywhere. Rarely has a band been at the center of a cultural explosion as powerful as that of San Francisco in the 60's. So many of the things we take for granted today as being part of the art of rock music can be traced directly back to that point in time. The spectacular light shows, the mind altering drugs, the gorgeous album covers and concert posters that can stand on their own as fine art - these all began in the sixties and the Dead were involved in one way or another. 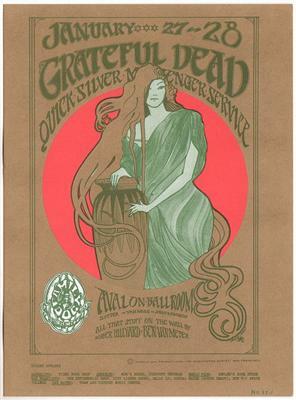 The psychedelic posters that Chet Helms and Bill Graham started using to promote their concerts have become some of the most important and sought after works of art produced in the twentieth century. Many of the the artists responsible for them have become famous in their own right. The Dead's music inspired many wonderful images in their album art. A lot of the same artists that worked on their concert posters were hired by the band to illustrate their albums. Many famous photographers were inspired to document the band both in concert and everyday life. They range from fans with cameras to professionals hired by magazines and concert promoters or even the band themselves. 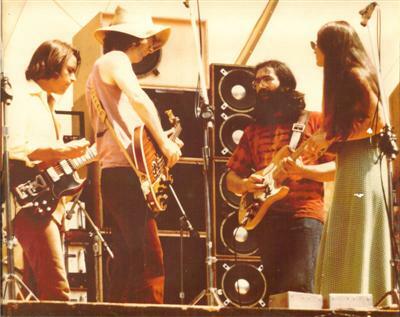 The Dead may be one of the most often photographed bands ever. Few bands have so many cool graphics, images and logos that are instantly recognizable to millions of people. Many came directly from their album and poster art such as the famous GD dancing bears. 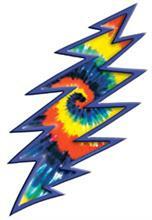 I have nearly as much interest in Grateful Dead art as I do in their music. The wildly creative images associated with the band are a big part of their appeal. I've got this stuff plastered all over my walls, my computer, my bookshelves and my CD racks. Unfortunately I can't afford most of the original art since it has become somewhat rare and highly collectible over the years. I really just want it for decorative purposes anyway so I settle for later printings and less expensive reproductions. 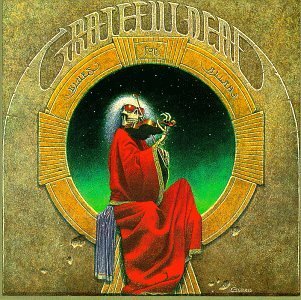 That way I can still immerse myself in the Grateful Dead art that I love and which adds so much to the band's whole mystique. If you're looking for some cool GD memorabilia to decorate your walls be sure to check out Wolfgang's Vault . 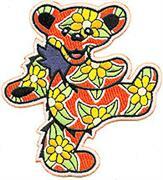 For some awesome free Grateful Dead desktop wallpaper and computer backgrounds take a look at www.g-tigerclaw.com. The site is owned by George Glasser and features his artwork and writing as well as a short bio.